You must have heard many people say ‘Image is everything’. Well, even if it’s not everything, it’s still something that the majority of us care about deeply. A good number of us would do just about anything to get our old appearances back and that’s understandable. Take our hairline, for instance. If it thins or falls out, you will go digging up effective ways to fix this. And of all the solutions you will come across, there’s one you should definitely pay extra attention to: Non-Surgical Hair Replacement Systems. For the uninitiated, this system makes use of customized and natural looking hair pieces to cover the affected area(s). No surgery of any kind will be needed to fix the hair yet it’s so good that when fixed on the affected areas, you can’t even tell it apart from the natural hair. In the case of the head, this type of hair is usually attached specifically where the follicles had been previously. As the wearer, you will not experience any inconveniences because the process is only done with the help of a medical adhesive. Sometimes the adhesive used in attaching the systems will depend on the material the system uses. Never worry that the hairpiece could come off because in most cases, a long lasting medical grade adhesive with hypoallergenic qualities will be used. In the case the non-surgical hair replacement is to be attached alongside real human hair, the hairpiece can be customised to maintain uniformity. One thing to note is that the adhesive can sometimes cause allergic reactions so to ensure this is well taken care of, always seek the help of competent and experienced hairdressers. Alternatively, the hair can be attached through sewing but this is not as common, easy, and reliable as medical adhesives. Besides, it needs a skilled and experienced person since the hair should neither be too loose nor tight for it to be comfortable. A well-maintained hairpiece will be able to last a couple of months before you replace it again. Just as it is with growing follicles, the hair will eventually break and fall out. And to avoid this becoming noticeable, you will have to get rid of it and have it undergo maintenance. Why Opt for Non Surgical Replacement Hair? Of all the best solutions available today for hair loss or balding scalps, this particular non-surgical method counts among the best yet cheapest solution one can get. Not everyone can afford surgical hair replacement. But if you have a couple of hundred dollars set aside for your hair loss treatment, then look no further than this non-surgical solution. Instant improvement of your appearance– there’s freedom to decide how you want the new hair to look including matching it your remaining natural hair. Perfect for people with special needs – if you’ve suffered hair loss as a result of medical procedures such as chemotherapy and you look to reclaiming your look back, this non-surgical method can help you achieve that goal. It’s affordable and convenient– A non-surgical replacement hair system won’t cripple you financially compared to other hair loss solutions. Besides, a good number of us have a particular fear for surgery and this solution is an alternative you feel comfortable with anytime. Please note that for this to be done right, you have to choose a hair salon with competent and experienced hairdressers who will offer a replacement that will bring your initial look back. 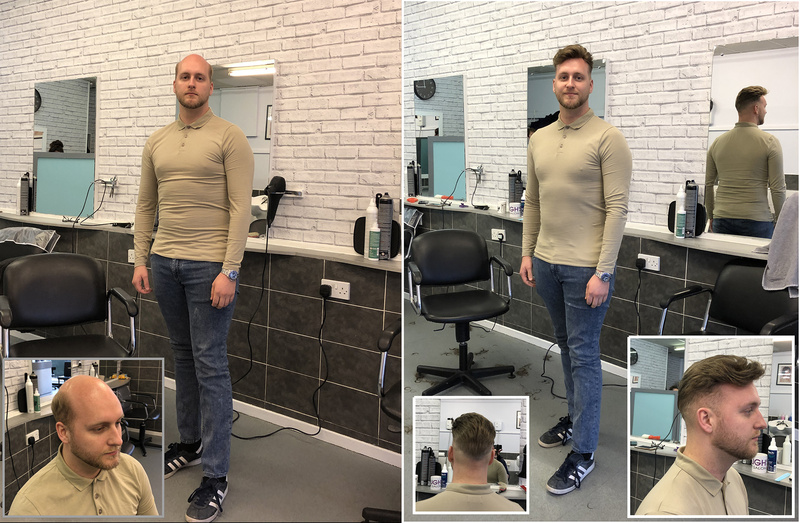 For the last 30 years, Hough Hair Salon in Wolverhampton has helped those who suffer hair loss to have their previous looks back through their quality non-surgical hair replacement systems and wigs. We all want to get reasonable value for our money and at Hough, it’s not any less. Five of Hough’s staffs have stuck with them for over 20 years thereby fetching rich experience and skills they’ve used to attend to clients from all over the UK and beyond. Consultation is free; you don’t have to book an appointment. Just give them a call and they will guide you on what to do.